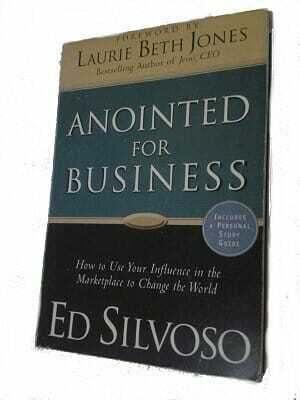 Anointed for Business by Ed Silvoso is a good read for anyone in the marketplace whether as an employee or employer. It answers the question that most believers struggle with but never really knew how to express it. Many religious leaders and institutions for years have had a tendency to view the ministry and the marketplace as separate entities. As a result of this perspective some believers have felt almost guilty for being industrious in the marketplace and not in the church. The prevailing belief in most homes around the world is that money is evil even though it is false. This belief adds to the feeling that making money is not as good as being involved in the work of the ministry. In this book Ed Silvoso dispels that line of thought and explains why as he makes reference to the Word of God. Everything in life is ministry. Your work is your ministry and through the measure of faith God has given you can make an impact for His Kingdom. There is one particular perspective he shares that helped me to understand ministry from a different point of view. Most people will never have the opportunity to stand behind a pulpit and preach before an entire congregation. However, in the marketplace the people you serve and work with are your ‘congregation’. The way you do business can minister to someone better than a sermon on how to do business. This form of ministry is no less important than someone in full-time ministry. If you believe you are anointed for business then pursue that in the name of the Lord knowing that you are advancing His Kingdom as you apply the principles of His Word in the marketplace. As you study the gospels you will learn that Jesus was a carpenter’s son and worked in that industry with his family. A lot of Jesus’ parables were marketplace related to teach the multitudes about the Kingdom of God. Through the family business He was able to finance the work of his ministry (though He did get help from others) as opposed to the belief held by some people that He was poor. His life was a good example of being a marketplace leader. He had learned a trade as a young man to make a living for the family and advance the work of His ministry. If you have felt that you cannot be a good Christian by being involved in the marketplace then you do not have to feel that way anymore. You have the perfect example in Jesus to learn from. 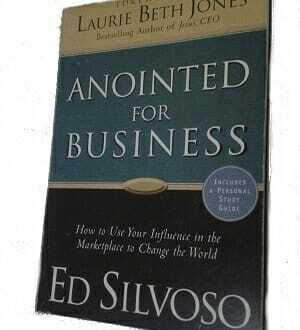 Ed Silvoso shares some steps you should take to find your place in the marketplace to bring about change and be a blessing in your sphere of influence. In light of what is happening in organizations all around the world these are good guidelines to follow to make the world a better place. It is a gift from God. Recognize that your job is a gift from God no matter what kind of job it is. Ideally you would want to work in an environment that you like and be happy working in but that is not always the case unfortunately. God has a purpose for everything that happens in your life and uses all of them for your good and His glory. Embrace the system. The world’s corporate system is very oppressive and designed to control the people working it. History teaches us that in the days of old people labored for themselves to provide for their families without the need to work for someone else. People were co-dependent rather by engaging in barter trade for the various products and services they could exchange. The idea of creating a system to have people work for someone else was designed with the idea of maintaining power over the multitudes of people operating that system. This is how people get stuck in their careers because they have developed a dependency syndrome on someone else for their livelihood. That is the sad truth about the system. You are encouraged to embrace it nonetheless because God has a plan for you in that system if you will let him work through you to accomplish it. You just have to trust Him. Improve the system. God will give you ideas to make a difference in your area of influence and it is your responsibility to implement them to improve the system. The Bible has examples of great men and women who made a difference by carrying out instructions they were given by God. They helped save the lives of multitudes and bring glory to God. Bring the Kingdom to your job. The Kingdom of God dwells in the hearts of men as opposed to thinking of it as being somewhere out there in Heaven. As you begin to work on what God has put on your heart let the heart of God flow in everything you do. Upholding integrity in your marketplace dealings, treating customers and employees right, etc. Those actions are a form of ministry that will make others see Jesus in you. As long as you are identified with Christ your purpose will always be to become a blessing to the people that God has put in your sphere of influence. The inspired ideas He gives you are not just for your benefit but more for the benefit of many other people. A good example of this is Joseph whom God strategically placed in Egypt to govern when the time was right so that he could save nations from dying of hunger. No one could have designed his journey to that position the way it happened in his life. Many life situations do not make sense when viewed in isolation except from God’s ultimate plan for your life. God is working on you right now to bring change in your life. You have to trust the process He is taking you through to see His plan fulfilled in your life. Thank you for taking the time to read this review. If you have not read the book I urge you to get a copy and study it. As you begin to apply the principles in your life watch what God will do. Remember to share the post and your thoughts in the comments below.